NEW! Same as MP-6 except includes extra reinforcement on the frame of the machine to protect against batted balls. Also includes positive feed ball delivery. Wt. : 625 lbs. 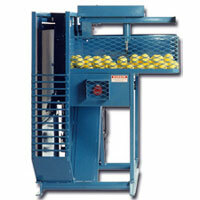 Same as MP-6 except includes extra reinforcement on the frame of the machine to protect against batted balls. Also includes positive feed ball delivery. Wt. : 625 lbs.